Blowout Sale! Free Shipping Included! 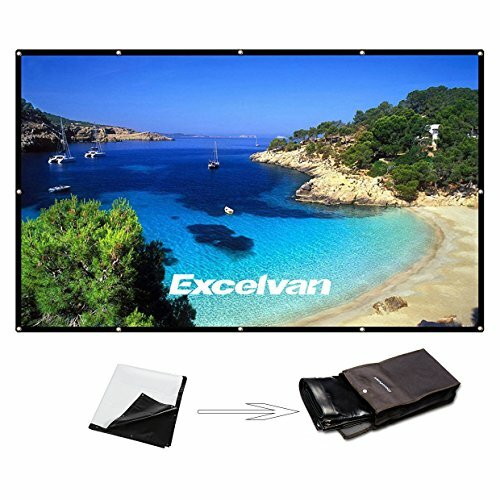 Save 53% on the Excelvan 100 Inch 16:9 High Contrast Collapsible PVC HD 4K Portable Projector Screen with Hanging Hole Grommets for Front Projection Home Indoor and Outdoor Movie Match Party by Excelvan at Home Entertainment Centers Online. MPN: 170526-M3. Hurry! Limited time offer. Offer valid only while supplies last. 【Priority Warranty】: All Excelvan projector screens have 24 months replacement and 30 business days full refund warranty, 100% satisfaction and zero hassle return guaranteed. 【Wide Viewing angle】: With 1.1-1.2 gain and 160° viewing angle, 16:9 screen format and diagonal 100", offering 22.1x12.4cm/87.17"x49.02" viewing area. 【High Contrast Collapsible PVC Material】: PVC Composite resin material, smooth non-deformation surface, and reinforced edges, 32 grommets installed make the screen convenience durable in use. 【32 Hanging Holes】: Hanging holes offer easy and quick installation. Lightweight and compact one-piece design, convenient to carry and easy to set-up. This screen is an upgraded one with holes, for the velcro one, please see B00SZLNUEY.